The former Walker Cup star, who earned £3,750 to move up 45 spots to 30th in the money list, finished alongside Cheese and overnight leader Jack Colegate on 12 under par on Slaley Halls’ par-72 Priestman Course. But it was Cheese claimed his first HotelPlanner.com PGA EuroPro Tour title at the first extra hole, the 18th, by hitting his approach stone dead for a tap in birdie. Colegate, who himself played a tremendous approach after hitting his tee shot right, two-putted for par and Caldwell chipped on from just off the back left edge of the green before holing for par. “When myself and Caldwell came in I think we were one behind and at the time Colegate had four holes to play,” explained Cheese, who wom £10,000, a brand new Motocaddy and a Shotsaver range finder. “I had a putt on the last as well which had been a good chance to get to -13 but I missed it and in all honesty thought that was it, but luckily it was enough to get in the play off. “I was pleased with the approach shot, it was good. Playing down the hill you never know how far it is going to go but it pitched and landed in a place as good as it could have been without going in." Spaniard Sebastian Garcia Grout finished fourth, two behind the leading trio, while Sam Connor, Ross Kellett and Michael McGeady (72) tied for fifth on nine under. McGeady earned £1,200 to move up three spots to 25th in the money list with Colm Moriarty (70, -7) banking £575 for a share of 13th and Tim Rice (72, -2) £282 for joint 32nd. Highlights of the Break90 Classic will air on Sky Sports on Tuesday, August 26 at 8pm, repeated at various times the following day. The next HotelPlanner.com PGA EuroPro Tour event is the WPT Invitational at Prince’s Golf Club in Sandwich, Kent, which begins on Tuesday. European Tour — He missed the cut by two but Mount Juliet touring professional Kevin Phelan showed his fighting spirit in the Made in Denmark event in Aalborg. As Welshman Bradley Dredge (68) birdied four of his last six holes at Himmerland Golf & Spa Resort to open up a four stroke lead on eight under over Englishman Simon Wakefield (67), rookie Phelan followed an opening 82 with an immaculate, six under 65. His five over total was not enough to make the weekend but at 143rd in the Race to Dubai it is a round that will give him confidence going forward. It was a positive day too for Gareth Maybin, 136th in the money list, as he followed a 75 with a 67 to move up to tied 25th on level par with Damien McGrane (70) a shot further back in 35th. Struggling Dubliner Peter Lawrie had to make a par at the last to make just his fourth cut of the season, adding a 75 to his opening 70 to survive with a shot to spare on three over. Simon Thornton (76-70) and Michel Hoey (73-73) made it on the four over limit but David Higgins (76-72) missed by two. Two-time European Tour winner Dredge is chasing his first title since the 2006 Omega European Masters and is also trying to improve his position in the Race to Dubai, where he currently sits in 182nd position. He will also have home favourites Thomas Björn (73) and Thorbjørn Olesen (70) to contend with over the weekend, despite joint overnight leader Björn losing ground with a round that contained only one birdie. The Danish pair are tied for third position on three under par, along with Scotland’s David Drysdale and England’s Garrick Porteous, both of whom signed for rounds of 68. Dredge said: “If someone had said I’ll give you a four shot lead after 36 holes you would take it. We’re halfway through the tournament and I’ve been in similar positions to this before. "I know a lot can happen and I’ve got to play really well over the weekend. There are some really good players chasing me so I have to keep playing the way I have been and convert the chances I get. “I feel as though the Tour events I’m playing in this year are like Majors to me, with my situation. I know that when I come out here I have to play well and perform. Challenge Tour — Rosapenna's Ruaidhri McGee shot a four under 67 to Austria's HP Bacher and Guillaume Cabris of France by five shots in the Vacon Open in Finland. 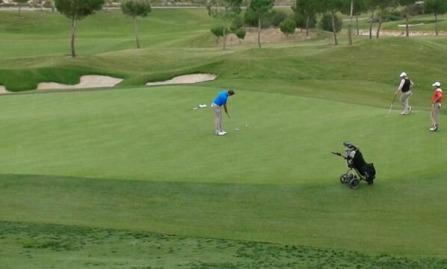 Bacher shot a 64 and Cambris a 66 to leave them one clear of England's Charlie Ford (68) on 11 under. The rest of the Irish missed the cut with Rathmore's Alan Dunbar carding four birdies in a row from his 12th hole to dip under the cut line only to bogey his 17th and miss by one on level par after a 69. Stephen Grant (68) missed by two despite a 68 while Mike Kelly (69) was five over and Reeve Whitson (72) 10 over. LPGA — Stephanie Meadow missed the cut in the Wegmans LPGA Championship in New York. Brittany Luncicome shot 68 to lead by three shots on nine under par from Inbee Park (66) but Paula Creamer missed her first cut in a major as professional. Rounds of 73 and 77 left her four shots outside the mark, ends her streak of 39 straight major cuts — two more than Tiger Woods' career best. Jamie Donaldson continued his commanding charge towards a third European Tour title and an automatic qualification spot for The 2014 Ryder Cup as Kevin Phelan fired a super 69 to make the cut with ease in the inaugural D+D REAL Czech Masters. Harrington loses PGA Tour card: "I just can't get out of my own way. Such is life!"